From 13 unusual takes on the shaving brush to interactive live and work spaces, we've picked out the best in show at this year's WantedDesign trade fairs in New York. Taking place during the citywide NYCxDesign festival, WantedDesign 2017 is located across two venues: Terminal Stores in Manhattan and Industry City in Brooklyn. Dezeen is media partner for the seventh edition of WantedDesign, and to mark the end of NYCxDesign we'll be co-hosting a closing party at South Street Seaport – where Wanted currently has a pop-up design store. This will take place 7-10pm, 24 May 2017 and is open to all. As winners of this year's American Design Honors programme, Studio Gorm from Oregon is presenting an installation of its products and furniture, ranging from minimal baskets with curved corners, to cup holders and a doorstop. 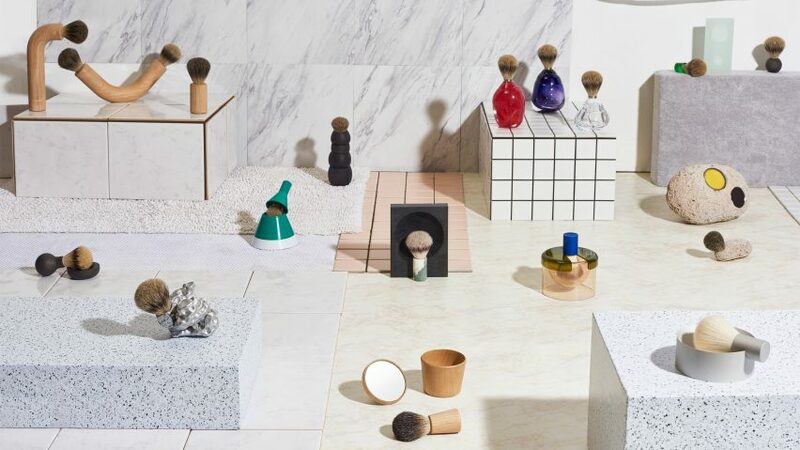 Brooklyn design studio Good Thing and grooming brand Harry's asked 13 designers to reimagine the typical shaving brush. Results include a magnetic tower by Pat and Kim, and a version with a lightbulb-shaped handle by Visibility. On display as part of the Launch Pad exhibition of emerging talent, this minimal light by Amanda Anderson features a square of copper folded at the edges and a cork lightbulb socket. The copper is left unfinished so that it will develop a patina over time. Over in Brooklyn, the University of Oregon's Product Design department is showcasing items from its Sports Product Design masters – the only one of its kind in the US. Focusing on adaptive sports, the designs include a brace to support the posture of players in wheelchairs, and a pair of Mermants that strap legs together while swimming. Seventeen emerging Dutch designers are exhibiting products under the theme of Human Nature. The showcase includes woven porcelain lights by Alissa + Nienke and artist Nynke Koster's rubber-cast Elements of Time stools. Industrial designer Jordan Tomnuk is launching a lighting collection called Veil, comprising two pendants and a wall sconce. All feature shades made of perforated metal sheets, while the bulbs are handblown glass. Thin sheets of metal are curved into benches and tables in this whimsical furniture collection by Brooklyn-based Kin & Company. The range of finishes includes a black oxide patina and an opalescent heat-tempered blue. Design studio Fort Makers worked with magnetic wallpaper company Visual Magnetics to create this colourful wall installation, taking cues from stage sets designed by artists including Jean Dubuffet and Pablo Picasso. Visitors are invited to play with moving the different magnetic parts to create different compositions. Using products from Sony's Life Space UX, students at the Pratt Institute School of Design in collaboration with Rockwell Group principal Barry Richards have created an interactive installation, which showcases products in environments based on the homes and workspaces of six different creatives in New York City. Material brand Caesarstone and industrial design students from the Pratt Institute have imagined a self-sustaining kitchen for the year 2050, combining aquaponics, hydroponics, 3D-printing, water filtration, indoor farming, composting and food storage.